Full day excursion to discover the Viedma Glacier, the largest of Argentina.Starting from El Chalten, after 10 kilometers along Provincial Route 23 and then taking the road to Tunnel Bay after 8 kilometers you will reach the port from which the vessel departs towards the front of the glacier. The boat sails across the lake passing infront the Viedma Glacier.There are two guided tours, called Viedma Ice Trek, which allows hiking with crampons on the Surface of the glacier and Viedma Pro, for those who wish to pursue a more demanding physical activity incluiding ice climbing.Once you get to Bahia Tunel by car or bus, where you embark and after half an hour of navigation, ship will reach the Icebergs Bay , later you disembark near the glacier, to start trekking for a few minutes since you arrive to the glacier. Viedma Ice Trek: Total duration of the tour 6 hours. (2 hours of navigation). Physical demand low. Technical difficulty Low. Viedma Pro: Total duration of the tour 9 Hours. (2 hours of navigation). Physical demand medium. Technical difficulty Low. You can take a navigation on the lake spotting different glaciers of Vespigniani Range (two hours approximately) or cross to the north bank with the boat, where there is a delegation of Gendarmeria Nacional (Border Police) , from this point starts the trail by foot or by bike to Lake O ‘Higgins in Chile, via Laguna Larga and then the Laguna Redonda, reaching the Chilean border at milestone IV, open from November to March. After continuing a stretch more (13 kms. ), you get to Lake O’Higgins (Chile) where you ll find border police checkpoint ( Carabineros) , who will require passport or ID to carry out customs procedures ; this hike demands six hours, approximately. 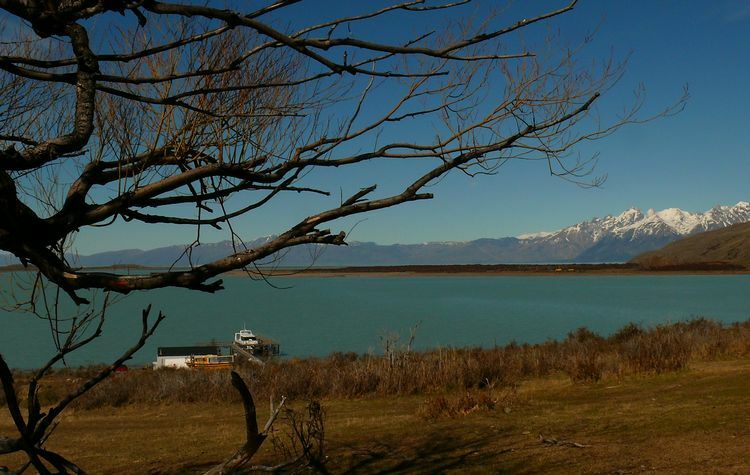 Already at the shores of Lake O’Higgins is allowed to camp or stay overnight at Candelario Mancilla, that also provides food. There is a ship crossing the lake once a week, allowing to get to Villa O’Higgins where the Carretera Austral begins. This interesting tour allows adventurers to cross into Chile from El Chalten ( and viceversa) , and continue their journey. This circuit, attracts an increasing number of tourists, who cross it by foot or bicycle every year.